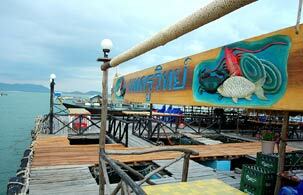 Kruvit Seafood Raft-Restaurant surrounded with Phuket east-coast Sea, a minute from Leam-Hin Pier. Here you will find good taste cuisine and live seafood with friendly services. The environment here remains fresh at all time, you can always feel the difference from the city life. We can guarantee that all of our dishes are highly quality and very fresh.